It is AD 273 and ‘grain man’ or spy Cassius Quintius Corbulo is stationed in Bostra, the capital of the Roman province of Arabia, growing accustomed to his military rank while bemoaning the absence of his manservant, Simo. Simo might be a slave, and a Christian one at that, but Cassius has never been able to shrug off his affection for the man who can anticipate his every need. A visit to Simo’s father, though, has overrun and Cassius is losing his patience. His ex-gladiator bodyguard Indavara is still by his side but even he, a man of few words, is showing signs of trying to shake off his ties to Cassius. It’s almost just as well, then, when spymaster Abascantius turns up with a new, perilous mission for Cassius and Indavara. The Black Stone, an object believed to conduit divine powers, has been stolen from Roman hands, which is unfortunate because emperor Aurelian is determined he needs it to sanctify his rule. Cassius is tasked with gathering a troop of Roman soldiers to go undercover as a merchant and his guards to trace the stone into the desert. The quest will begin in the city of Petra where, it is believed, an agent may have some clues for them (if the local gangs haven’t killed him first for his gambling debts). All the time, though, they hear stories of a new chief in the hills, supported by a tall blond giant and an old woman, who is gathering the local tribes to him. It doesn’t take an imperial agent to work out that Rome has a new enemy. 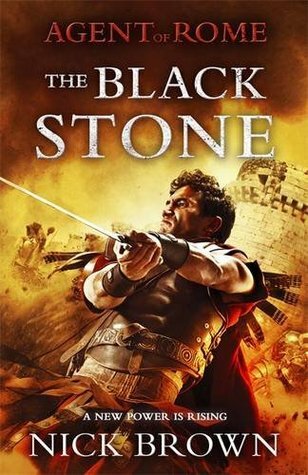 The Black Stone is the fourth in Nick Brown’s wonderful Agent of Rome series and this one is a little different to its predecessors. At almost 500 pages, it is by far the longest and this means that extra time is given to the action adventure element of the story and the increasingly involved relationships between Cassius, Indavara and, once he returns, Simo. For me, this is a particularly strong feature of the novel and I thoroughly enjoyed getting to know more about Simo and – especially – Cassius and Indavara. The action part of the novel is extremely exciting and well-plotted, which is what you’d expect from Nick Brown after three other excellent Roman adventures, but while I did enjoy the mystery and enigma of Ilaha and Gutha, I was enthralled by the developing drama between Cassius, Indavara and Simo. During the later stages of the novel, this grows to great heights and there were tears – a fair few of which were mine. Both Cassius and Indavara are very young men dealing with events completely out of the ordinary. Simo is the man who could keep them sane but, as his allegiance turns increasingly to Christ, Cassius has to deal with this and he doesn’t like it. All sorts of questions about slavery are raised here. Honour and bravery also play their part as many of the characters, those with both large and small roles to play, are placed in positions where they have to question their loyalty to their leader, their families, their emperor or chief and their gods – as well as to their own memory. All of this contributes to a tale that is both exciting and poignant in places. Religion as a theme gets considerable attention in The Black Stone, not just the Christianity of Simo but also the cultism of Ilaha and the more formal Roman religion of Cassius and his men. Indavara continues to be confused by other men’s relationships to their gods but here, in his own worship, another side of Cassius is glimpsed. These large themes are lightly placed into the novel and it raises the adventure into something very memorable. Its ending leaves the reader crying out for more and I have no doubt that this wonderful series will continue to grow from strength to strength. I am a huge fan of this series and I was delighted to post quite recently an interview with Nick Brown to celebrate the publication of The Imperial Banner, the previous novel, in paperback format. To mark the publication of The Black Stone here is another interview with an author who is increasingly one of my very favourites. Congratulations on The Black Stone. The Far Shore was quite an act to follow but you more than succeeded! The Black Stone is the fourth novel in the Agent of Rome series. Is the series developing as you thought it would when you set out? Thanks. 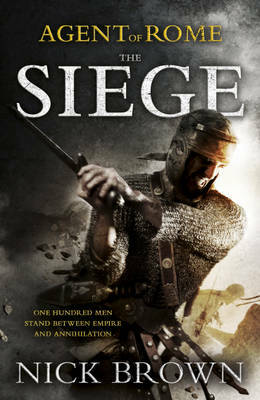 I suppose I didn’t really know how it would develop when I was working on ‘The Siege’. The second book was the key – establishing the Cassius/Indavara/Simo team and seeing them thrown into the first of their assignments. From there we follow the ongoing development of their relationships but also the specific stories of each book. The Black Stone represents another change because it’s not really a mystery but more of a military mission and a real adventure as they journey into the Arabian desert. The Black Stone is the longest of the series at nearly 500 pages. I really enjoyed this, as a fan of longer novels that I can spend good time with, but did this present new challenges for you as a writer? Definitely. For the first time since The Siege I decided to follow one of the antagonists because I wanted the reader to get ‘up close and personal’ with the warrior-priest Ilaha and his rebel allies. This always takes a lot of planning in terms of how much to reveal. It was also difficult initially to get a handle on the relationship between Rome and Arabia but this provided some really interesting material; Cassius finds himself in the middle of powerful political, religious and economic forces. This is a high adventure as you’d expect from this series but towards the end of The Black Stone the thrills are mixed with some powerful emotional scenes that really moved me. They also reminded me how young Cassius and Indavara are. How important is ait that your readers care for these characters? Very important. It’s certainly something I always look for as a reader. Over time I’ve tried to add depth and detail to their characters, backgrounds and their relationships with each other. They are very young as you say and – like most in the ancient world – have had to grow up quickly. The three of them are so different that, once established, all I really have to do is throw them together and see what happens! That usually generates a few arguments, a few laughs, and – as in the conclusion of this book – some dramatic and emotional scenes. Simo’s Christianity is starting to cause some real friction in his relationship with Cassius and has added a fascinating dimension to the books. There is also some frightening cultism on show here, as well as superstitions and more traditional Roman religions. Can you talk a little here about your interest in the beliefs held by the novel’s characters? Antioch was a centre of Christianity in the Roman East so when I was developing Simo it seemed realistic as well as compelling. As a writer you are always looking for conflict and drama and this was a factor that would create long running issues between servant and master. It has also allowed me to explore the beliefs and attitudes of the time and I have tried to present a balanced, realistic account. All three principal characters have their own relationship with ‘the divine’, something which requires quite a leap of imagination for modern readers – and writers. Where next for Cassius, Indavara and Simo? Without giving too much away, I can say that the trio will be returning to a province they’ve already seen but facing a threat unlike any they’ve faced. Cassius is due to finish his term of service in a couple more years. Can you reassure me that this won’t mean the end of the Agent of Rome?! A lot will be packed into his remaining years as a ‘grain man’ and then we’ll see! I’m reading R.S. Downie’s first Ruso mystery – very much enjoying it so far. This entry was posted in Historical Fiction, Interview, Review, Roman and tagged Blog Tour, Feature, Historical fiction on June 5, 2014 by Kate (For Winter Nights).